Pula is located on the southern tip of the Istria peninsula in northern Croatia. Surrounded by seven hills, and with the vivid blue of the Adriatic in the foreground, Pula is a charming city with an ancient history. Pula holidays are popular with those looking for a city break as there is much to see and do both in the city itself and in the surrounding area. We have a range of cheap Pula holidays which offer excellent value for money. 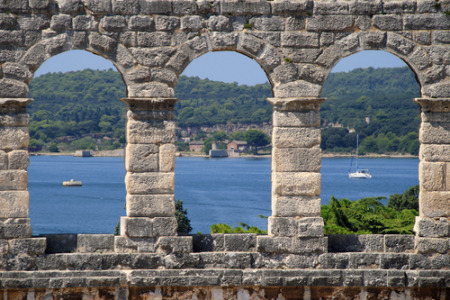 Holidays in Pula attract a variety of visitors from those interested in ancient remains to those who are attracted by the coastal waters. Grab yourself a bargain Pula holiday and try your hand at diving, looking for wrecks as diverse as Roman galleys and second World War warships. Those with an interest in history and architecture will enjoy the many fine buildings including the well preserved Roman amphitheatre dating from the first century. In the old quarter of the city you can walk on the same paving slabs as the Romans. Holidays to Pula offer good accommodation, restaurants catering for all tastes, excellent shopping and a lively nightlife. Search now to find our latest Pula holiday offers.